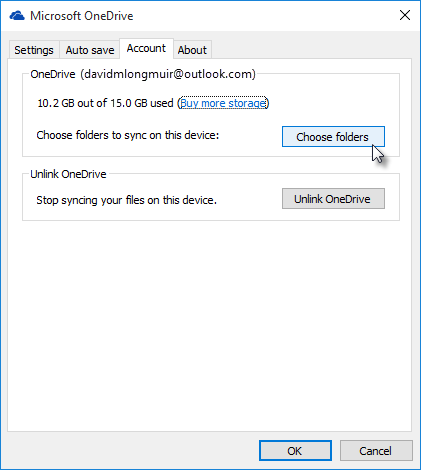 OneDrive is syncing fine. I can see all files and folders in the cloud. I also have the option to "save" any of my MS Office files to any of my available OneDrive folders. However, when I open the One Drive Folder from Windows Explorer, there are no folders or files visible. I know all of the folders and files are on my PC (windows 10) but I cannot see any of them. I understand your that you are unable to find your files under the OneDrive folder of your PC. I will be happy to assist you. Unlike in Windows 8.1, OneDrive in Windows 10 doesn’t use placeholder files to indicate files that are online only. Instead, you see only the files you choose to sync to your computer. Keep us posted if you face any issues with OneDrive in future. We will be glad to help you. I have already done that and the files and folders are on my computer (somewhere?). Everything is syncing between OD and my PC. I have both added and deleted files in One Driver folders and seen the changes on my device and in the cloud. I just can't see the OD files in Windows Explorer. I suggest you to reset OneDrive and check if it helps. Be aware that resetting OneDrive re-syncs all your OneDrive files, which could take some time depending on how many files you’re syncing. This restarted OneDrive, everything resynced on my PC BUT I still cannot see the folders in the OneDrive Folder. Basically, I still have the same issue. This can be an issue with the location where the OneDrive folder is configured. I suggest you move the OneDrive folder location and check if you face the issue, To do so refer the section"Move the OneDrive Folder in Windows 10, Windows 7, and Previous Operating Systems" from the below article. Do reply to us with the results to guide you better. Glad to know that the issue has been resolved. If you have any issues with OneDrive in future feel free to reply us we'll be happy to assist you. Now I can see the files that weren't showing up before but in onedrive.live.com, the online onenote files show up as a onenote 'file' of 85MB. Now in windows explorer, they show up with the file name but as a 1KB 'Internet Shortcut'. I want to see the actual 85MB 'file' in explorer so I can make a backup copy to another physical drive. This is a fail from microsoft then.....why doesnt it give you the option to sync files in the One drive file on documents.... ? I saveed a file to cloud in my office and then came home and couldnt find it....great user experience. every time a user has to 'google' an issue, its a flaw...what are microsoft managers getting paid to do? maybe they should open a 'logic' dept rather then think of countless apps that no one uses anyway. Has anyone ever got an answer by doing this ,,i currently running at about 1000 to 0 ratio of fixing the problem.